In this example, we're going to install InfluxDB and Grafana on same machine (Ubuntu 16.04) then configure both so that Grafana can visualise data stored in InfluxDB. We will be using InfluxDB version 1.3.5 and Grafana version 4.4.3. At the time of writing this post, InfluxDB was considered as the best and most performant timeseries data storage. TCP port 8086 for client-server communication over InfluxDB's HTTP API. TCP port 8088 for the RPC service for backup and restore purposes. You can configure port mapping and other properties through /etc/influxdb/influxdb.conf file. You can see the logs by running journalctl -u influxdb command. Note: If data is pushed to InfluxDB from other host machines, you must synchronize time between all hosts with Network Time Protocol (NTP). If you don't do it, the timestamps on the data written to InfluxDB can be inaccurate. Timestamp data is stored as in UTC format. You can use date command to check the time. If you wish, you can install and use Chronograf as web based GUI for InfluxDB. 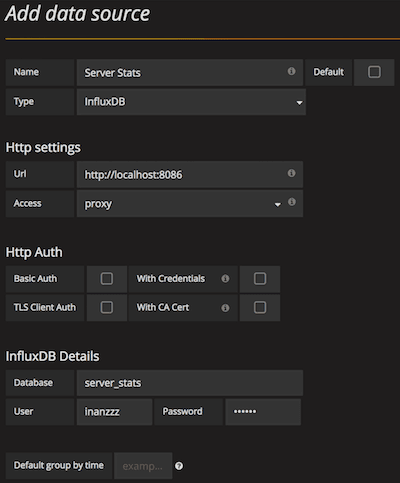 Install and start the InfluxDB service. If you run influxd command, you'll see basic details about the service. If you run influxd config command, you'll see service's default configurations. Note: By default, you can login to database without going through the authentication then run any queries you wish. We will enable authentication later on. Check current users. By default, there won't be any user defined. List tables in _internal database. Query httpd table in _internal database. Do the following to prevent unauthenticated access to database. We will create an admin user and let only admin user to access to database with username and password. Create an admin user with all privileges. Look for auth-enabled in /etc/influxdb/influxdb.conf configuration file and set it as auth-enabled = true in order to enable authentication. Testing without username and password doesn't even let us list databases anymore. Please set a database with the command "use ". Testing with authentication works as expected. to store some statistics about CPU. to use in our queries. It will help us differentiate stats per host or region. Then we are going to assign float data to value field as stat. Note: If you want, you can manually provide Unix nanosecond timestamp with the data. If you don't, system's time will be used. If we're to explain it in more technical way, it would be something like below. $ curl -i -XPOST http://localhost:8086/query -u inanzzz:123123 --data-urlencode "q=CREATE DATABASE server_stats"
Create table and populate with dummy data. It creates table only if it doesn't exist. As you can see above and confirm below, we inserted dummy data that belongs to server01 and server02 hosts in same europa region. The first two data sets for each hosts are based on same time and the last sets are based on different times. Apart from visualising the data, you can also use it trigger alerts such as Slack, email etc. 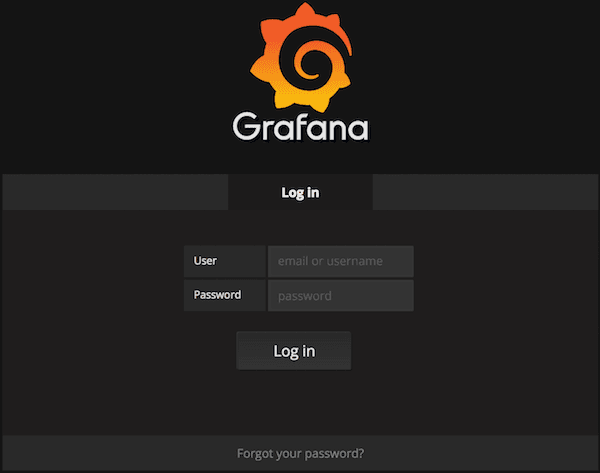 Install and start Grafana service. Browse to http://192.168.99.30:3000 and login with admin:admin. Go to http://192.168.99.30:3000 and login with admin:admin. Click Grafana icon in the top header and select "Data Sources" option. Click "Add data source" button in the page. Fill the fields in as you see in the image below and click "Add" button. If you click Grafana icon in the top header and select "Data Sources", you should see image below. Click Grafana icon in the top header, select "Dashboard" option then "New". Click "Graph" icon in the page. Click "Panel Title" header of the graph and select "Edit". Configure "Metrics" as seen image below. Save it as "Host stats" by clicking disk icon on top of the page. This will produce graph below. If you enable graph's auto-refresh option and populate influxDB with more data, you would see the graph changing in real time. You can run command below to add more data against server02 host and look at the graph for testing purposes. Graph should look like image below.